Women in the military are more likely to be assaulted by a fellow soldier than killed in combat, studies have found. 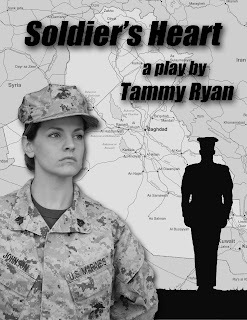 “Soldier’s Heart”, a stage play by Tammy Ryan to be performed at the Academy of Music in Northampton September 18-20, confronts that issue head on, telling the story of Marine Sergeant Casey Johnson, a single mother, who leaves her young son behind and goes to war in Iraq. 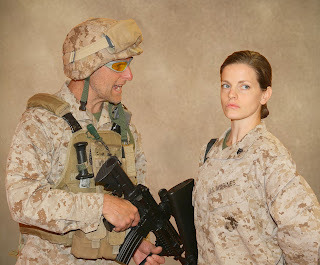 In Iraq, amidst the horrors of combat, she experiences “military sexual trauma” by a fellow Marine. Once home and in the grip of PTSD, she faces a daily struggle of survival in a post-war life. “Soldier’s Heart” not only looks at the subject of “MST”, but explores the issues that many returning combat vets face when their battlefield is now within their hearts and minds. With assistance from Leigh Paz, a Marine veteran of Operation Iraqi Freedom and Transitional Patient Advocate at the Veterans Affairs Medical Center in Leeds, Freedman tries to examine what it means to be a combat veteran. Given the nature of the story, Freedman is also relying on help from Sara Eichstaedt, a clinical social worker and MST counselor with the U.S. Department of Veterans Affairs. “Having the correct Marine uniforms are necessary, but it is essential to understand the trauma that impacts Sgt. Casey Johnson”, Freedman added. Myka Plunkett of Northampton portrays Casey Johnson. Plunkett has performed with New Century Theater and at the Majestic Theater in West Springfield. SOLDIER’S HEART: September 18-19, 7:30 pm, September 20, 2 pm. Academy of Music, Northampton. 413-584-9032, ext., 105. Online: academyofmusictheatre.com, Box office hours: Tue.-Fri., 3 -6 pm. Tickets at the door. $20 general admission, $18 seniors, students, active duty military, veterans. Box office fees will apply. FOR MATURE AUDIENCES. This program is supported in part by a grant from the Northampton Arts Council, a local agency which is supported by the Massachusetts Cultural Council, state agency. Produced by special arrangement with the Susan Gurman Agency, LLC.